In late October, Nick Swisher took on the challenge of an appearance on Yahoo! Sports’ Old Baseball Cards video series with the goal of potentially finding one of his dad’s cards in a pack from back in 1983. That pack wasn’t his — and he’d have to pull off a trade with host Mike Oz if it happened — but what this high-energy video did do was bring me out of hibernation. It’s been a busy few years picking up treasures but they’ve all gone un-documented here where they should be seen but that all changed when my newest piece arrived today — a total surprise that genuinely confused me at first. I’ll be revamping the site soon with all kinds of new additions to the stash since my last update long, long ago … heck, I just added a sweet game-used jersey just yesterday. But, until then, check out the news of today by clicking here. Newest addition to The Swish Stash is a foul ball from a BCA game on May 12, 2013. During the top of the second inning it was fouled back to the screen off Detroit’s Rick Porcello at Comerica Park. 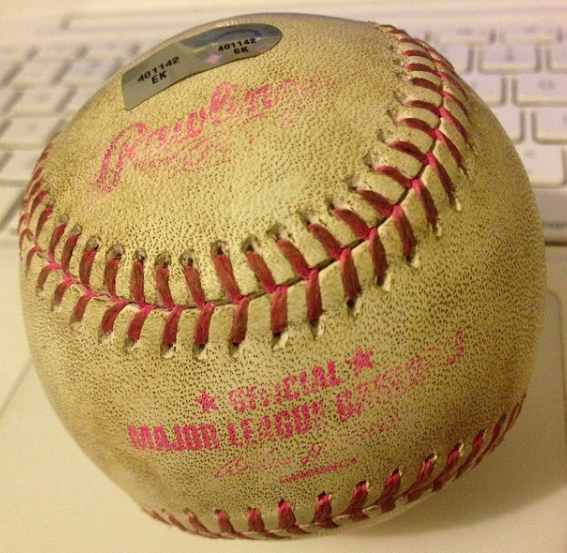 Pink stitches and pink stamping on ball, of course. 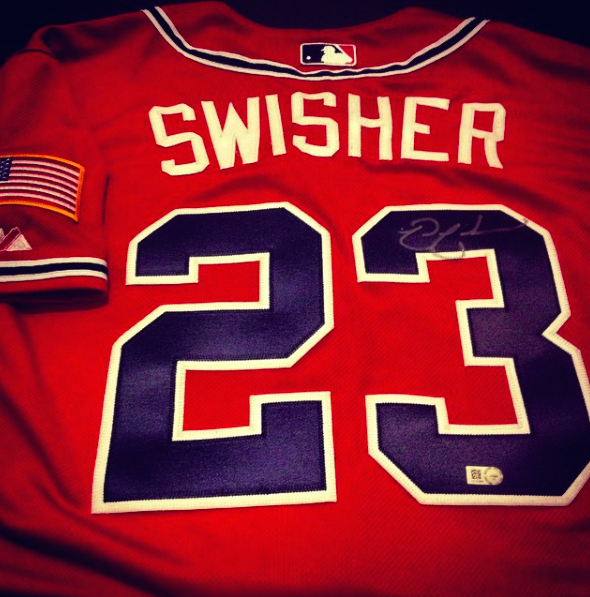 My latest pick-up made via a trade was a game-used Atlanta Braves jersey worn on Aug. 15, 2015 — the night Swisher hit his first home run as a member of the team and No. 242 for his career. It’s MLB Authenticated and cost a lot less — a lot less — than you might think. Some high-end boxes of sports cards cost more. Even cooler? 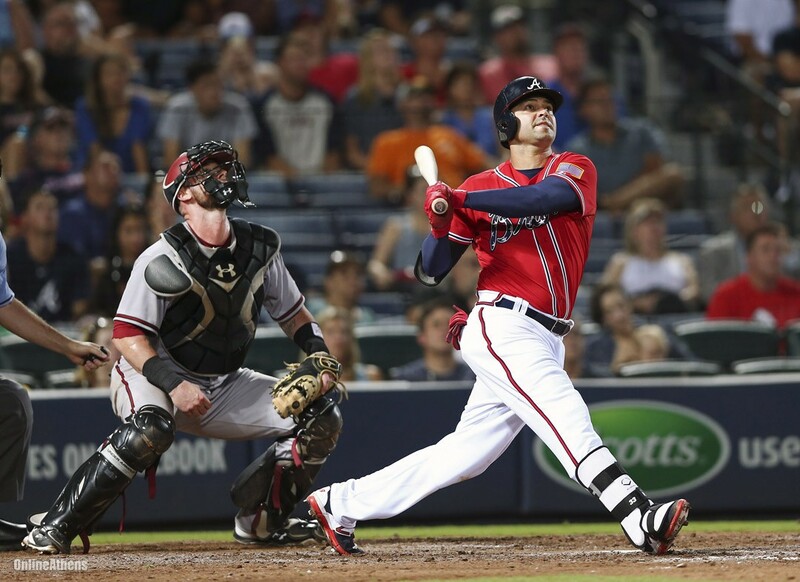 Here’s a shot of Swisher watching the homer leave Turner Field. I’ll be trying a new look here once I get back into the swing of things … so consider this a test. I may not own a Pristine copy of Steve Swisher‘s 1975 Topps Rookie Card, but my latest edition seems even more unique and interesting than any high-grade copy of a card older than I am. It’s the slide or color transparency used to make the card and it was recently sold via the Topps Vault, Topps’ online sales arm that brings remnants of past card creations back to life and helps get them into collectors’ pockets. The negative is just as it was recently found in an envelope in the company’s files — but now is mounted in a sealed case on a white cardboard slip. It doesn’t scan all that well, but you get the idea from what’s seen here. There’s likely only one — at least only one that was saved — and it’s mine. I picked off his 1976 image as well, landing both for a lot less than the price of a new Topps wax box. 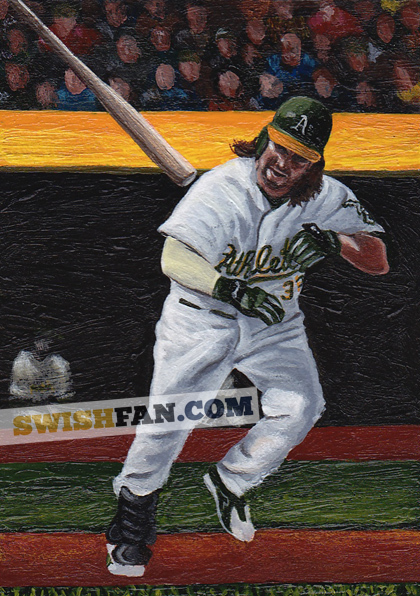 The 2014 Topps Series 1 set arrived on Jan. 29 with Swish appearing on a (rarer) short-printed version of his card showing him celebrating the Tribe’s postseason berth. It was my first Swish for the year — and certainly won’t be the last. Well, I didn’t post here much in 2013 … but I did tweet plenty o SwishPics over on Instagram (@chrisolds2013 there, @chrisolds2009 on Twitter) and here’s some of the proof. 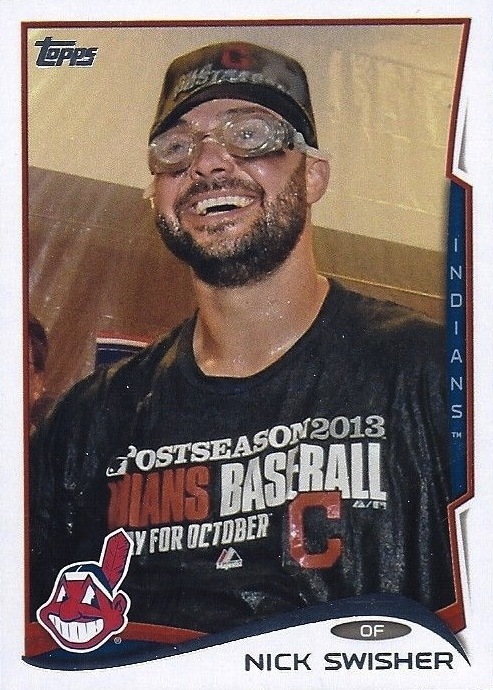 The first baseball card sets of 2013 have arrived and that means it’s time for the first card of Nick Swisher in a Cleveland Indians uniform. The set? Why, it’s 2013 Topps Heritage — a modern-day remake of the 1964 Topps set. I’ve pulled just two from packs so far — it’s obviously a Photoshop job (I give it three Swishes out of five), but it’ll do for now since the ol’ airbrush wasn’t uncommon back in the day. The laundry tag card isn’t all that common for some players as there just aren’t a ton of jerseys chopped up each year for baseball cards. Although I am sure he has a few — but not many — my only Nick Swisher tag card comes from the 2009 Ballpark Collection Laundry Tags set where a tag made the cut to make just five serial-numbered cards. It wasn’t super-expensive but it also wasn’t single-jersey swatch cheap, either. Definitely a slightly cooler card than some, though. Do you have a Swisher item I might want? Contact me on Twitter, @chrisolds2009. Thanks to @tomtheripper on Twitter, I now have a promo trailer for SwishFan.com … check it out in its HD glory (and be sure to view it as a fullscreen vid. There are a lot of game-used Relic cards out there — and plenty for Nick Swisher just like most guys these days — but this set, these Allen & Ginter minis, are among my annual favorites. This is Swish’s 2006 Allen & Ginter Relic, which has a piece of a game-used jersey embedded into the framed mini. I have plenty of them — and I’ll always pick up more of them when the price is right. The first Ginter set will always be a favorite of many but the Relics have actually improved in little ways the last few years. So far, I have them all when it comes to Swisher. When a player becomes a New York Yankee, a lot changes — and it’s got nothing to do with long hair (read the link … he had a great reason), beards, Hollywood wives, etc. It’s got everything to do with deep-pocketed fans of, hands down, the most-successful baseball team in the world. Nick Swisher being a New York Yankee means I end up paying more for his key cards — if I can land them at all. One such example? This 2009 SP Authentic Signatures card is a short-print — and it’s one of just a few Yankees autographs. But it’s also just one of the many stickers he’s signed for a few years now — just like plenty of cheaper autographs out there. I got sick of missing out on the card — the few times it came up for sale — and I had to pony up to land it for the cost of about 4-5 other Swish autographs. But this Beckett.com forum post is pretty entertaining, though. I often found a way to have my profession — journalism — cross paths with my hobby before my current job made that meshing permanent. 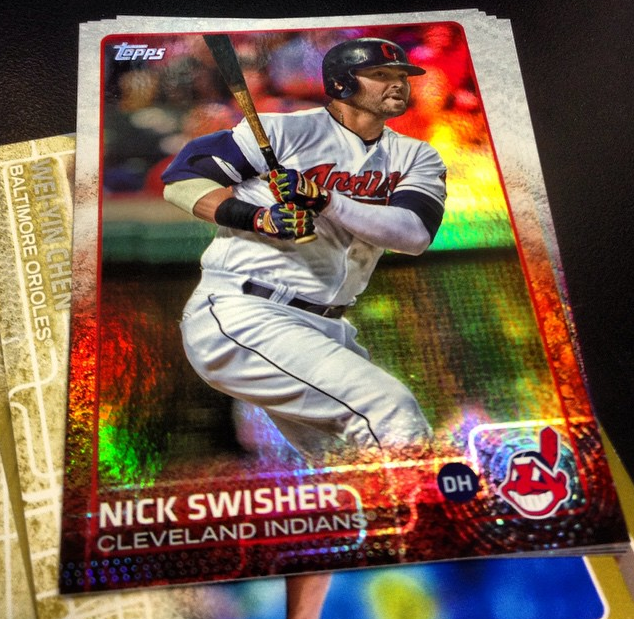 Here’s one where Nick Swisher had a prominent place in one project almost entirely by accident. In late 2006 during a lull one night while working the copy desk at the Orlando Sentinel, I hopped on eBay to see what Swisher stuff I could find. 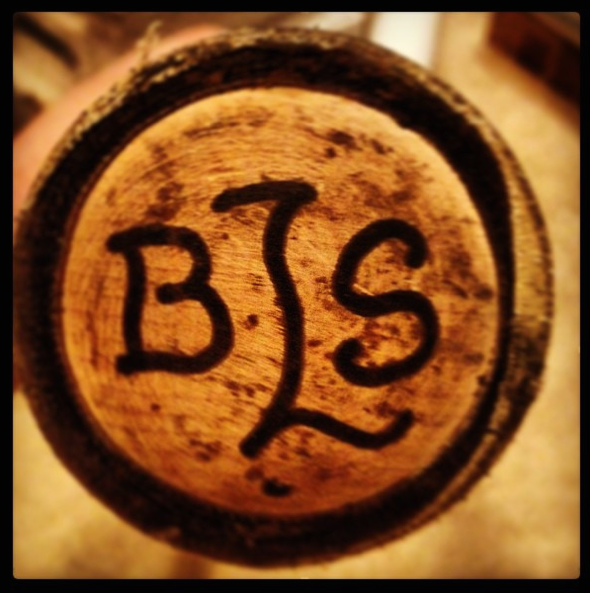 I found the game-used bat you see at the bottom of the above image — firewood, really — for $50 Buy it Now. At that point, I didn’t have a game-used bat — just a signed pro stock bat — so the credit card couldn’t come out of the wallet fast enough. 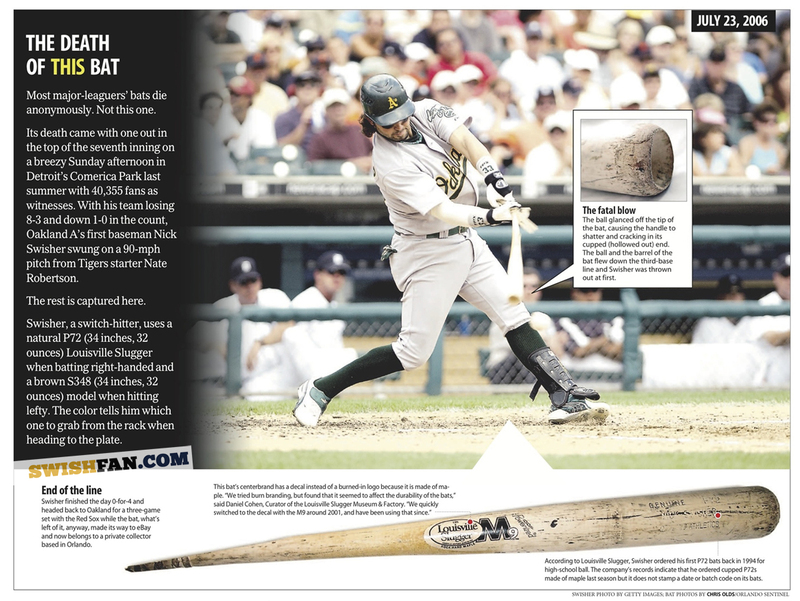 A few months later — for the newspaper’s 2007 Spring Training preview special section — the combo was the centerpiece of an infographic about the life of a baseball bat from forest to death (and beyond as a game-used baseball card). I pitched that idea for information and aesthetic for the entire section with this exact item in mind. I wrote, researched and gathered the info for the spread while one of our designers, Adam Shiver, pulled it all together. You’ll see a few other baseball-card related items on the entire package. Click on the image above to read the story of the Swisher bat — and see the full doubletruck infographic from the newspaper after the jump. As a kid, I collected Jose Canseco, who had a twin brother who played baseball. Never knew that until after I started collecting — so it was a bonus. As it turns out, Nick Swisher’s dad, Steve, played in the major leagues, too, and later managed in the minors. He was an All-Star (barely — good story there) and appears on 44 different baseball cards with his Rookie Card arriving in 1975 Topps. While I can’t say I have tracked them all down — it wouldn’t be too tough so it’s on the eternal to-do list — I have picked up some interesting items here and there that I’ll showcase here from time to time. How’s this for starters? It’s Steve Swisher’s 1981 Topps baseball card contract straight from The Topps Vault. He signed it on March 25, 1981, which makes it his last contract with the company and, for trivia’s sake, the only one signed after his future All-Star (barely — good story there, too) was born. The Allen & Ginter line launched by Topps in 2006 is, hands down, my favorite brand of the last decade, and that’s reflected in my Nick Swisher collection to a degree. I don’t own each and every version of all of his Ginter minis — in fact, it’s kind of embarrassing how many I don’t own — but I always have put a lot more emphasis on rarer cards than I do parallels. And, of course, I collect on a relative budget, too. I’d rather overpay for a rarer card like this than a Bazooka parallel where there are plenty more copies to be found … someday. Swish has a pair of cards in the 2007 Allen & Ginter set — got those, of course — but the standard mini’s printing plates have eluded me. I have zero of the four 1/1s there. However, the Swisher “EXT” card — an “extended” mini found only in Rip Cards — has plates, too, and I own two of the four. I didn’t scan the backs of my plates — so I don’t know which plate is which. But I think I own the Cyan and Magenta plates because his name is not visible here (would be seen on the Black) and neither card appears light like a Yellow plate might read. Do you have any other Ginter Swisher plates? They’re very high on my list of wants — and one in particular is one reason why SwishFan.com exists. I’m on the hunt — and I’ll write about that in the future. You can see both of my plates after the jump. 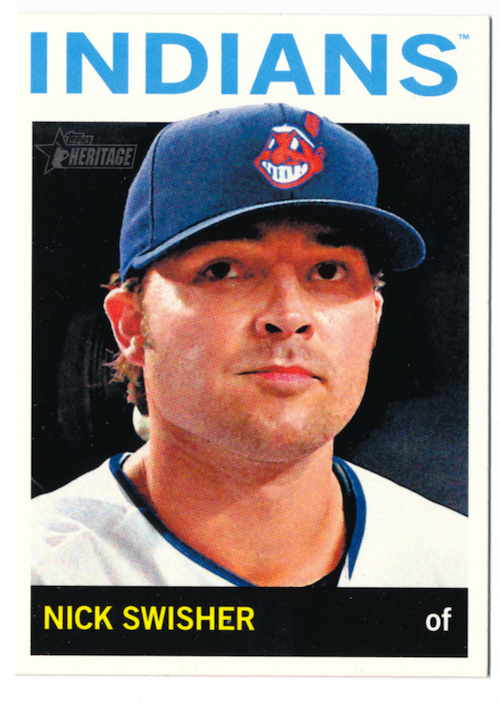 There’s not too much overly special going on with this 2009 Inkredible Nick Swisher card … but it’s a great design for a sticker autograph and a solid photo and simple design. I actually like this one a lot, and, as a plus, it’s one of not many signed cards showing Swish as a member of the Chicago White Sox. That’s about that for this one.